My autobiography will not be written on a computer, or disseminated in the form of a kindle file. It exists already in the collection of ornaments that have been lovingly cared for, some since before I was born. 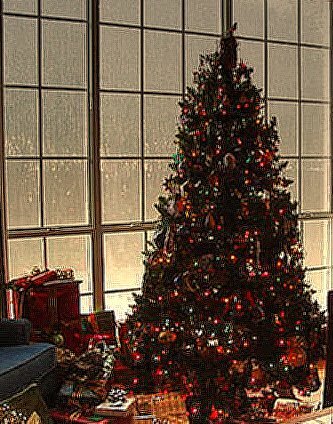 My earliest Christmas memories are of decorating the tree with my mother. We would usually do this on a Friday or Saturday evening in December, with Christmas music playing in the background, and both of us singing along, my mother with… great enthusiasm. Twenty Christmases later, my collection of ornaments has grown exponentially. Our first tree was barely full, and the tree we had in our condo was three feet tall and in a pot. This year, we have a pre-lit plastic tree with seven million tips (this may be an exaggeration) that is seven and a half feet tall (that is not an exaggeration), and I still feel like there aren’t enough branches. Last year, my mother sent some of her collection to me; she was downsizing to accommodate her smaller house and slightly advanced age (she’ll be 66 in February), and it was a kind of virtual reunion, seeing some old favorites and meeting some new pieces from her life in Mexico. I’ve never done a count of all my ornaments – there are more than a hundred and less than five thousand – but I know when one is missing, as if a paragraph or a chapter was accidentally deleted from a favorite novel. My ornaments are my story, my autobiography, told in red and green, wood and glass, and set against a background of pine. Autobiography in Pine by Melissa Bartell is licensed under a Creative Commons Attribution-NonCommercial-NoDerivatives 4.0 International License. I love this entry. I wanted to give that gift to my children and gave them special ornaments every year until they grew up, but nobody remember who had which ornament and nobody seems to want them. The memories that you have never seemed to matter to my kids. I grew up with special ornaments too – my sister has many of them. I kept the one I liked the best, but it got broken, alas!